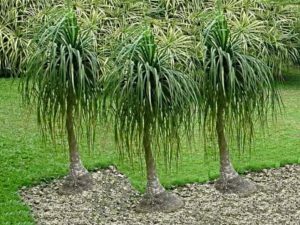 The Ponytail palm is a perfect indoor palm tree with a gray, inflated trunk and long, grass-like, arching and drooping green leaves that hang down like a pony tail (hence it gets its name). It is also caled the Elephant Foot palm because its large, swollen, bulblike base sometimes appearing as an elephant’s foot. The Ponytail palm is not really a palm tree, but a flowering plant of the genus Beaucamea. It is closely related to Yuccas. Beaucamea Recurvata is one of the easiest indoor palm trees to grow. In its natural habitat the Ponytail palm grows up to 30 feet tall, as a house plant it doesn’t grow over 2-7 feet.